Methamphetamine (meth) addiction treatment has become an increasingly urgent public health need over the decades. While its popularity has ebbed and flowed since its introduction into the illicit-drug landscape, meth has been a consistent threat to many Americans, and this threat has only increased in recent years. The Centers for Disease Control and Prevention (CDC) reports that meth overdoses have more than doubled over the past fifteen years. The problem has become a particularly urgent threat in rural areas in Texas, Oklahoma, and parts of Washington State. The Pew Research Center indicates that in 2015, nearly five-thousand Americans succumbed to meth overdose, representing a 30 percent increase from the prior year. Detox and Withdrawal Management. The meth withdrawal period can be particularly arduous and unpredictable. It’s important to remember that the contents of meth can vary greatly from batch to batch, as the drug is often cooked up in makeshift domestic labs. To that end, meth users need medically supervised detox and withdrawal management to help them mitigate their symptoms and to intervene in the event of a medical emergency. Meth detox typically lasts around five to seven days but can vary according to a patient’s progress and ongoing symptoms. These symptoms will dissipate over time; however, they can take months to finally fully subside. Behavioral Rehab. Prolonged and untreated meth abuse can severely impact a user’s mental health and quality of life; as a result, many users often require intense behavioral rehab to repair the damage and relearn certain life skills that will help them effectively transition back into their everyday lives. While meth addiction treatment is offered in inpatient, outpatient, and intensive outpatient (IOP) models, it is highly recommended that those suffering from serious addiction seek residential (inpatient) care. The primary focus of behavioral rehab is to help patients recognize and safely manage the emotional factors that drive and sustain their substance abuse, so they can live safely, productively, and independently in recovery without the constant threat of relapse and withdrawal. After patients complete their initial treatment program, they may be eligible for sober-living residences where they can continue toward recovery while incrementally re-establishing themselves in their everyday lives and family dynamics. Aftercare plans feature referral resources to addiction-trained mental health professionals and recovery meetings in their area. Meth addiction very quickly yields a variety of physical and psychological indicators. Unfortunately, those addicted seldom get help on their own, so it’s often up to friends and loved ones to identify signs. Hyperexcited state for prolonged periods. It’s critical that patients experiencing these symptoms, or any others related to their meth use, get help immediately. There are more resources than ever to make meth addiction treatment affordable and accessible, including increased state Medicaid subsidies and certain employer-sponsored health insurance plans. 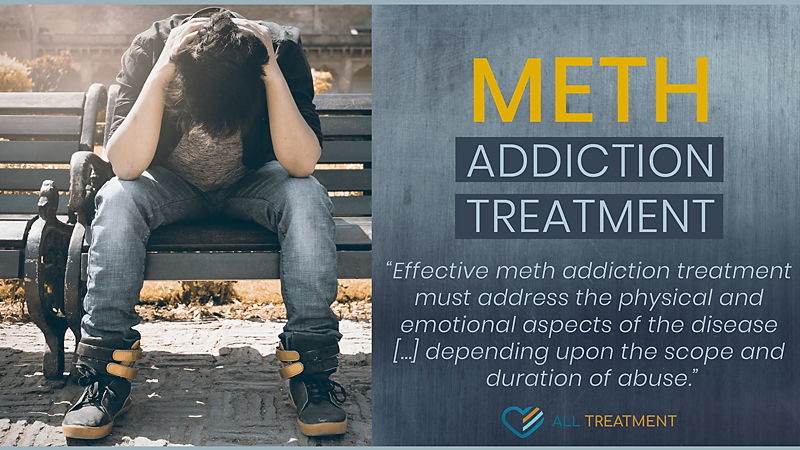 The longer you or a loved one engages in untreated meth abuse, the more vulnerable you become to overdose and other serious long-term health risks. You don’t have to be a victim of the endless cycle of relapse and withdrawal. Get the help you need today to start fighting back.